Let There Be No Confusion (323/365 year 3) – Annoyingly Boring? The fact that it was more of a bruise than a cut and didn’t actually need a big bandage was not important. 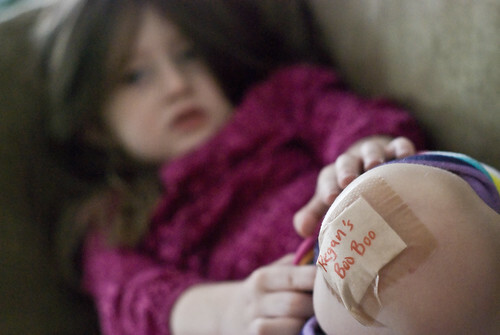 The fact that the bandage needed to be labeled to announce to the world that it was her boo boo was very important. And if you can actually believe it… I am CAUGHT UP!!! After running anywhere from three to ten days behind in my posts it feels good to once again be current!